New Arrivals from £20 at Levi's Shop the new season styles from just £20! Men's Coats and Jackets from £70 at Levi's Wrap up in style this winter with men's coats and jackets at Levi's from £70. 20% Student Discount at Levi's Take a break from the books and get 20% off when ordering at Levi's! Women's Jeans from £65 at Levi's - Bootcut, Skinny, High-Waist and More Shop the collection of Levi's jeans and find some new additions to add to your wardrobe. Free Delivery on Orders Over £49.99 at Levi's No need to worry about delivery fees when you're spending big. Delivery is free on orders over £49.99! Men's Jeans from £65 at Levi's Find your perfect style today at Levi's. Women's Shoes and Accessories from £8 at Levi's From socks and shoes to pins and patches, you'll find the perfect gift from £8! Free Returns on Orders at Levi's We understand that what you order isn't always what you imagined. If you need to, send it back to Levi's for free! Women's Sweaters and Sweatshirts from £40 at Levi's Shop the range and keep yourself wrapped up this Winter with sweaters and sweatshirts from £40 at Levi's! Women's Dresses and Overalls from £40 at Levi's Sweater dresses, jumpsuits and dungarees - all from £40 at Levi's! Men's T-Shirts from £20 at Levi's T-Shirts from £20 at Levi's! Men's Shoes from £55 at Levi's Step up your style with shoes from £55 at Levi's! Kids Clothing from £15 at Levi's Kit out the kids with clothing starting from £15! 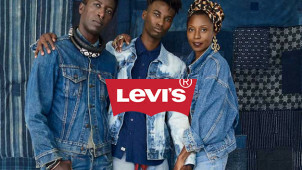 While now better known as just Levi's, the full original company name is Levi Strauss & Co and it is a brand that has been around since 1853, when its German-born founder, Levi Strauss, moved to California during the Gold Rush and opened a clothing retail business. It wasn't until 1872 when he teamed up with a designer from Reno that the riveted denim jean was born, designed to be more durable and long lasting than other clothing and sold as workwear. A year later, blue jeans were patented, and those iconic blue jeans as we know them today were born. Levis is a worldwide fashion brand that still provides resilient clothing that is built to last, while also offering timeless style to everyone with a soft spot for the Denim look. For work, everyday play, festivals and more - at Levi's you can even find the perfect pair of jeans to take your look from day to night. With a bountiful selection of goods for men, women and children on offer - the whole family can find their style with Levi's. Men can find sweaters and shirts galore to team with their favourite denim, while ladies can go sleek and perfect their silhouette with Revel jeans, or find something more casual cool in the Vintage collection. With options for women with curves too, you will always find the perfect fitting pair of jeans here. To complete your look, you can also browse apparel such as jackets, t-shirts, jumpers and more alongside a grand array of accessories. With funky prints and soft fabrics in scarfs, bandanas, beanies and more - hone in and play with your style here. Levi's even has shoes available that are crafted from the finest materials and always on trend with that authentic Levi's finish. With items to suit you and your everyday lifestyle - it really is that easy to love living in Levi's. How do I use my Levis discount code? Any deals without a discount code will be applied automatically so you can continue to checkout with your savings. Subscribe with your email address to get 10% off and free shipping on your next Levi's order! Does Levi's do student discount? You can get a 20% student discount at Levi's when you're registered with UNiDAYS. Track down your nearest Levi's store using their online store locator if you'd like to try Levis clothing in person. When is the Levi's sale? There may be seasonal sales, meanwhile, you can check out the Levi's outlets for a bargain using the store locator! Next Day Delivery: £9.99 - order by 11am. Returns are available for 28 days after purchase. Every parcel has a pre-paid UPS returns label - simply attach and return your parcel as it was sent to you. Levi’s is that iconic brand that everyone knows and loves. With its denim that’s stylishly worn the world over by those who need robust and durable apparel alongside those who simply love the cool Levi’s look - with a Levis discount code you can get it too for less. From timeless classic denim cuts to the latest contemporary jeans, jackets and more to keep you on trend - if you love denim, then you'll love saving money at Levi’s with us! The famous Levis 501 jeans, which are still among the brand's bestsellers, were first designed in 1873! A favourite with both men and women, while trends like skinny jeans and flared jeans come and go, the 501 is as much an iconic item and wardrobe staple for people of all ages as the LBD is for women. Find out about the heritage behind Levi’s in the Featured Stories section and you’ll see that there is more to your favourite denim numbers than may meet the eye! When it comes to jeans, we live in Levi’s. Ladies can choose from styles like skinny, super skinny, the 501 boyfriend cut and more, while men can find rugged tapered cuts or bootleg styles and the list goes on. With a Levis voucher code you can save on a pair to suit your style perfectly. Plus, when you can tailor each pair to fit you like a glove - whatever your size or height - you can find a seamless fit with Levi’s.